This week our assignment from our Teach was to take some photos of signs, and for me it was quite a challenge but here is what, with the help of Bernie and the little red car, I was able to find in our little neck of the woods. This picture of Bernie inside the little red car was taken at sunrise and I must admit that it is a rarity for me to be up early enough to ever see a sunrise! The light ruby tints are a SIGN that it is going to be a nice day! This first picture tells you what city or large town that you are in.... Welland, the Rose City, Southern Ontario, Canada. The only roses in sight this time of the year are the frozen ones etched into this SIGN! Welland is known as the town where the "Rails and Water meet". Sad to say that this is the last bridge that we have. The other three bridges were torn down and over passes built. This is apparently a SIGN of progress but I for one, really don't like the destroying of our history! This huge "SIGN" is a mural that was painted by a local artist, Heinz Gaugel. It is painted on an outside wall of the Sea Way Mall on Niagara Street. It depicts the history of how the Welland Canal was created. Built with the hard work and sweating brows of our fore fathers! Now this is a SIGN that Ontario has been waiting to see for a long time! Just a few short weeks ago the price of gas was $1.36 per litre which equals $5.07 per American gallon. Well the little red car was surely happy that a fill up now costs only 69.9 per litre which equals $2.07 per American gallon! She can definitely take her owner out more often now! Alas though, there was no such thing as Wal-mart in those days! This is always a great SIGN to have. It is so unfortunate that the city didn't plough the roads properly though! The same goes for this SIGN. How does the city expect our children to be crossing from a snowy bank like THIS?! We spotted this beautiful SIGN along the highway and I had to get out to snap this picture. As you can see the bridge is a unique part of Welland and you can also see that Welland is very much bilingual! Well I guess the Canadians are telling you guys to "Get Cracking!" In Canada the washrooms are his and hers! One of the nicest things that anybody could ever see is a SIGN that says, "Free!" These Gospel plaques are made by an elderly gentleman in our church and he always puts a goodly supply here, free for the taking. The Sunday School children and even some adults help themselves! Hi Terri, I have something for you at my blog. Ha, ha, I love it that Bernie got you up and going at the crack of dawn in a red car just to capture some red signs:) The mural is gorgeous! All that snow reminds me of my college days. I lived just an hour north of where I am now, in Edinboro, PA, but it was in the "snow belt" - lots of lake effect snow from Lake Erie. We get a lot less here in Greenville. What a wonderful collection of all kinds of signs. I love your "get cracking" pun and the mural is quite stunning. 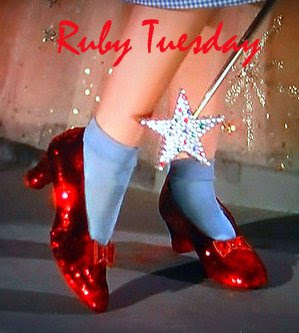 Great Ruby Tuesday post. This just about sums our city up Terry. Great shots of our great city. Great post Terry. Love the sunrise photo with the glow in the sky...really magical. You are making such good reports. Make me laugh and enjoy the ride in the red car. Bernie is the man for sure driving around letting you makes your elaborate ruby Tuesdays. I am strugggeling with the fever and the flue. Hope it never reaches Canada. Whew! You sure went overboard with those signs. I think the dented stop sign was my fav. It was nice to look at all the snow. Made me appreciate my home anew as I sit here wearing shorts, barefooted, with every window in the house open. I just scrolled through your blog. You certainly know how to celebrate your friends! Love Jack's little red car and all the photos are wonderful. Right now our gasoline is $1.56 American a gallon. It has been down as low as $1.25 but has gone back up thanks to the Arabians! !